For all the amazing technological progress made in analytics and cloud, the fundamental challenges of reliably transferring and distributing large files and volumes of big data at high speed to locations around the world still persist. In fact, this big data movement problem has only become more pervasive and daunting across industries, with the exponential growth of data generated globally. 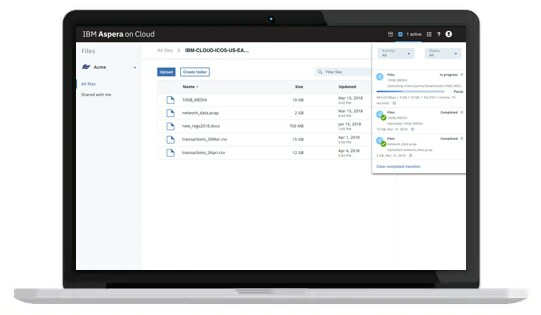 IBM Aspera® solutions are designed to help you globally ingest, distribute and synchronize huge files and folders directly to and from any major cloud or on-premises storage, without compromising performance or security. 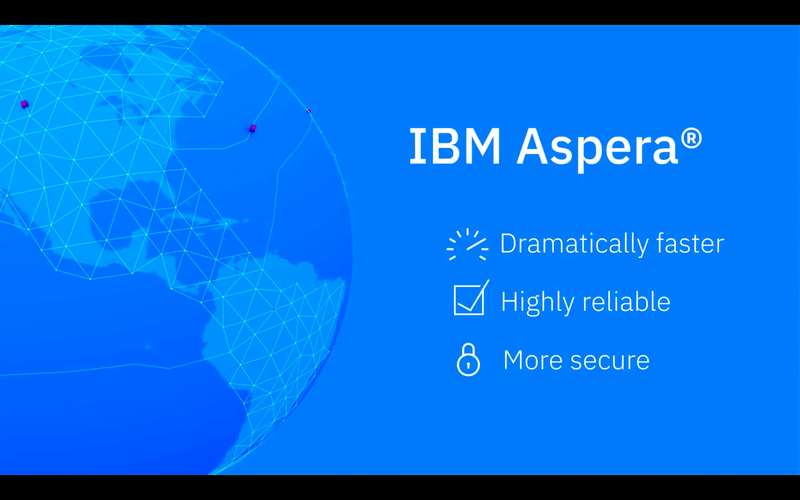 Built on the patented IBM FASP® transfer protocol — which consistently ranks first in every WAN-transfer throughput benchmark — Aspera solutions offer security-rich, scalable capabilities that can grow with your business. Ingest large volumes of data into cloud-based analytics platforms and high-performance computing (HPC) servers at maximum speed over global WANs. Meet service-level agreements (SLAs) for large-batch deliveries (for example, transactions, trades or policy changes) across global banking, trading and insurance systems; vendors; and processing sites. Reliably replicate and sync critical data over global WANs to significantly reduce recovery-point and recovery-time objectives and help ensure banking, trading and insurance applications keep running through a disaster. 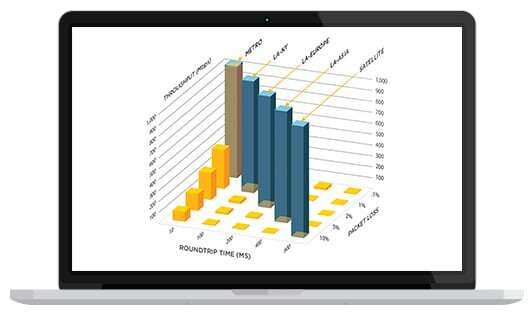 Shorten development cycles and improve global collaboration by distributing and replicating large engineering files and critical test data anywhere. Transfer petabytes of real-world video and HD map data, collected by vehicles in hours rather than weeks, to remote development teams working on next-generation software for self-driving cars. 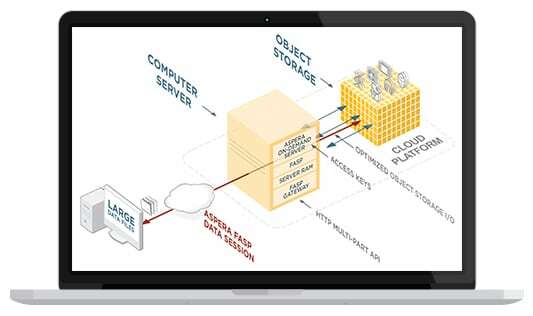 Ingest terabytes of data into HPC servers at maximum speed and quickly and more securely deploy findings to remote engineers, production sites or corporate teams. Sync terabytes of omics data across global labs in hours, not days, resulting in better use of specialized equipment. Optimize medical device makers’ transfers of large CAD files, test cases, software code and engineering artifacts across global engineering teams, test facilities and manufacturing sites to help keep production moving around the clock. 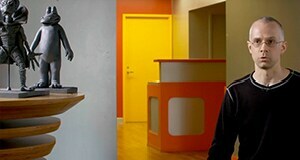 Move large volumes of huge 3D image sets to remote computing sites, researchers and medical centers for faster analysis. The NetApp customer success team benefits from automated workflows and transfer speeds up to 10 times faster than HTTPS. The Aspera solution also saved NetApp approximately USD 1 million by avoiding the build-out of a local storage site. Vancouver-based Rainmaker Entertainment uses an Aspera solution for fast, secure transfers of large media files to and from clients, helping them to meet tight project deadlines. Using the patented high-speed transfer technology of IBM Aspera, National Instruments synchronizes large software builds between teams around the world from its centralized data center in Austin, Texas, to significantly accelerate its follow-the-sun development. With an IBM Cloud™ hosting solution and IBM Aspera software, BlueBee delivers a powerful offering that accelerates genomics data processing for labs and genomic service providers. IBM Aspera’s industry-standard server software is the core of on-premises solutions for fast, reliable transfer of large files and data sets. IBM Aspera faspex provides global, person-to-person high-speed file delivery and exchange for files and directories of any size with email-style workflow. IBM Aspera Shares is a cloud-based solution that enables globally dispersed users and teams to share large files and directories. IBM Aspera Sync offers high-speed synchronization technology that replicates and synchronizes big data globally to support disaster recovery, file archiving and more. Explore this innovative high-speed transfer solution for moving large files and data sets among leading cloud storage platforms.